Jane Mitchell, founder of MindBodyFeeling, is an accredited mindfulness practitioner and teacher and a registered Learning Disability Nurse. 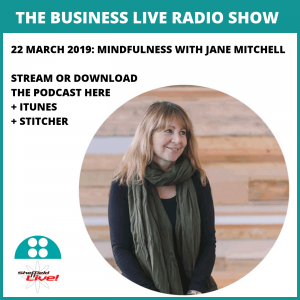 Jane helps people to “deepen their awareness of their own experience,” and was my guest on today’s radio show to describe her work and how mindfulness can help business leaders and social entrepreneurs. The podcast is below and in iTunes. “Mindfulness is the opposite of autopilot” says Jane, and involves being attentive, present in the current moment, in a non-judgemental way. She describes its benefits in the interview and runs through a simple, short exercise you can do (which I did, in the studio, during the interview). Here’s the podcast to download or stream (or find it in iTunes and Stitcher) – the timings and shownotes are underneath it. This episode also features news of a fantastic opportunity for social entrepreneurs, leaders of community enterprises, and other businesses and organisations making a demonstrable impact: The Cambridge Social Innovation Prize, which rewards achievement and ambition in social innovation. 0 – 5:35 Introduction and updates, including a joint letter from the TUC’s general secretary, Frances O’Grady, and the CBI’s Carolyn Fairbairn, warning that the UK faces a “national emergency” and warning of the danger of a no-deal Brexit; Sheffield Adventure Film Festival and The Outdoor Festival; Phlegm’s Mausoleum of the Giants; getting in touch. 5:35 Jane Mitchell part 1: Jane’s route to becoming a registered mindfulness practitioner. 14:55 What is mindfulness? How does mindfulness help people who are running businesses or social enterprises, or self-employed people, and why has there been an increase in interest in mindfulness? 28:40 Break. News of a fantastic opportunity for social entrepreneurs, leaders of community enterprises, and other businesses and organisations making a demonstrable impact: The Cambridge Social Innovation Prize. 31:29 Jane Mitchell part 2: if listeners are stressed, overwhelmed, on “autopilot,” feel pulled from deadline to deadline or have an “inner critic”: what techniques can they use to alleviate stress and to find a place of stillness or calm? 36:00 Jane runs through the three-minute breathing exercise, live in the studio with me and with listeners – you can take part too. 39:00 how did the three-minute breathing exercise make me feel? 44:00 what happens if engaging in mindfulness programmes or practices makes participants more aware of challenging or difficult issues – how do they deal with this? Is this a legitimate concern? 46:53 what does the accreditation in mindfulness mean? If listeners want to find a teacher, what should they look for, and where can they find teachers meeting guidelines for good practice? 48:38 – end how to reach Jane, her events, and wrapping up. Business Live radio show is broadcast live every Friday on Sheffield Live radio – and available as a podcast in iTunes here.